Studies in this week’s Hutchins Roundup find that trade with China has reduced men’s economic status relative to women, the sentiment expressed in Fed communication affects interest rate expectations, and more. Over the last three decades, marriage rates for young adults have declined, while the share of children born to unmarried mothers or living in single-headed households has surged. David Autor of MIT, Gordon Hanson of the University of California, San Diego, and David Dorn of the University of Zurich find that the decline in manufacturing is partly responsible for these changes in family structure. In particular, they find that trade shocks to manufacturing industries have had a disproportionate effect on young men by lowering their earnings relative to women and increasing their participation in risky and damaging behaviors. The authors find that this decline in the marriage-market value of men has reduced marriage rates and fertility, and increased the fraction of children born to young and unwed mothers and living in poor single-parent households. Paul Hubert of Sciences Po and Fabien Labondance of Université de Bourgogne Franche-Comté show that the sentiment conveyed by Federal Open Market Committee policymakers affects interest rates expectations, inflation, and output. To measure sentiment, the authors use computational linguistics to quantify the “tone” of FOMC statements and then label as “FOMC sentiment” changes in tone that are not explained by economic fundamentals or investor sentiment. 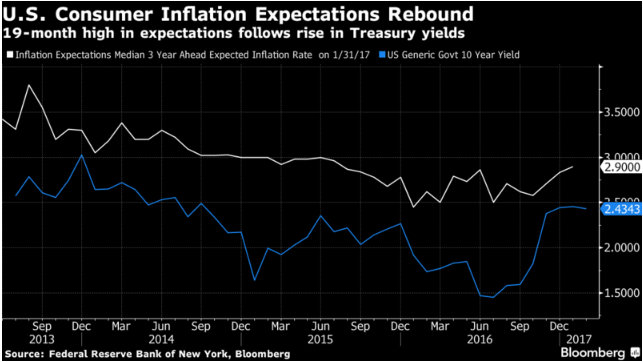 They conclude that a positive shock to FOMC sentiment increases private short-term interest rate expectations primarily at the one-year maturity, and also independently affects inflation expectations, inflation and industrial production. Using regional variation in house prices during 2006-2009 to measure local shocks, Xavier Giroud of MIT and Holger Mueller of New York University find that the presence of firms that operate in multiple regions mitigates the effects of local demand shocks. In particular, they find that a drop in local house prices reduces non-tradable employment — employment in sectors such as restaurants, supermarkets, and retail stores that rely on local demand – both locally and in other regions in which local firms have establishments. They conclude that firms play an important role in the provision of regional risk sharing and the propagation of local employment shocks across different regions of the US. Quote of the week: “Globalization can be made more sustainable if we make it more efficient, enduring and equitable,” says European Central Bank official Benoît Cœuré.